The cause and manner of the death of a 7-year-old boy with autism in northeast D.C. is still pending after a preliminary autopsy, police said Tuesday afternoon. The intense search for Michael Kingsbury began Sunday morning after his sister saw him walking in an alley close to their home in the 1700 block of West Virginia Avenue. Michael's mother, Katrina Kingsbury, told The Washington Post that Michael threw a light fixture out of an open window while playing in his room Sunday morning. She says he went after it, leaving the home through a back door. He was last seen between 9 a.m. and 9:30 a.m.
At the time, he was believed to be wearing a pull-up diaper, and possibly a red shirt. After the family looked for Michael without success, they called police about 10 a.m., and after a thorough search of the home, police broadcast a lookout for the boy at 10:06 a.m. and set up a crticial missing person command post at the scene. Police contacted area hospitals and the medical examiner's office and used a helicopter in canvassing the area. Police began tweeting about the boy's disappearance about 11 a.m.
A K-9 unit led to an unoccupied home several blocks south, police said, and police searched the campus of Gallaudet University. The search for Michael continued until about 5:50 p.m. Monday, when a sudden rush of police officers converged on a car in the alley. Sources told News4's Pat Collins that a veteran detective assigned to the search happened on the car and noticed something peculiar inside. The reaction at the scene was immediate, reported Jackie Bensen. People were heard screaming and crying, and police quickly increased their perimeter around the event. Michael was recovered from a car without tags, parked on private property, just two doors down from his home. His body was found face-down on the floor of the locked car, Collins reported. A police officer had looked in the locked car about 1:30 p.m. Sunday and did not see the body. Nor did at least two other officers -- one working the midnight shift and one searching during the day Monday. Even the family said they looked inside of the car because Michael had once before hid inside of a parked car. 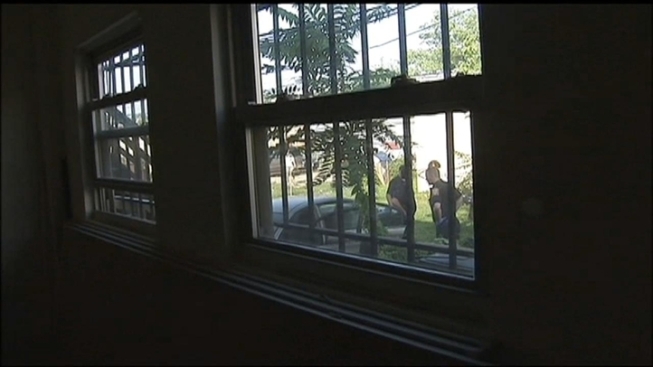 Police had to break a window of the car to get in and recover Michael's body. "We need to figure out when exactly [Michael] got in the car," Assistant D.C. Police Chief Peter Newsham said. "It's too early to see if someone missed something." The medical examiner found no signs of trauma to Michael's body and couldn't give an approximate time of death, police said, but there was obvious decomposition to the body. Homicide detectives were among those who responded to the scene, Bensen reported. However, it is not unusual to have homicide respond to a death investigation. Police have not ruled out anything. Michael's mother spoke with Bensen Monday night. "I'd like to thank everyone who came out to look for my son," Kingsbury said. The family had been distraught throughout the search for Michael, as police searched abandoned buildings and sheds Sunday and Monday. Kingsbury said it wan't like her son to wander away. "It's unusual for him to leave. It's never happened," she said. "As many times as he's been out here and played, he's never left the backyard. He knows not to go into the street." Neighbor Damian Bascon, who helped search for Michael, could onlly talk of what could have been Tuesday. "Everybody told me if they would've saw that boy walking, they would've protected him and kept him until his parents or someone came out," Bascon said. As the investigation into Michael's death continues, police are looking into at least one tip from a woman who said she'd seen Michael on a Metro train with a heavyset man. The woman told Michael's mother the boy had been playing with colorful pipe cleaners, The Post reports. Michael fascination with pipe cleaners had not previously been released to the public. On Tuesday, NBC4's Tom Sherwood spoke with D.C. Mayor Vincent Gray who expressed confidence in the police department, adding he expects a full report from Chief Cathy Lanier.